The holiday season is fast approaching. And I do mean fast folks! There’s roughly three weeks until the festivities go into full swing. If you’re like me– it’s a very busy time of year. Friends and family are coming to festive dinners, to planned parties, and there are always one or two who just show up unexpectedly. This would normally be very stressful– whether you’re trying to prepare an entire dinner throughout the day, or you need something on hand when hungry guests arrive to keep them tided over until meal time. Having a yummy, but easy appetizer that’s made ahead of time and kept chilled is a total lifeline. Guests will think you’re a genius. Kaukauna® Cheese is THE perfect ingredient for just this reason, which is why when I was in Kroger last week, I made sure I stocked up with a few of their cheese balls. 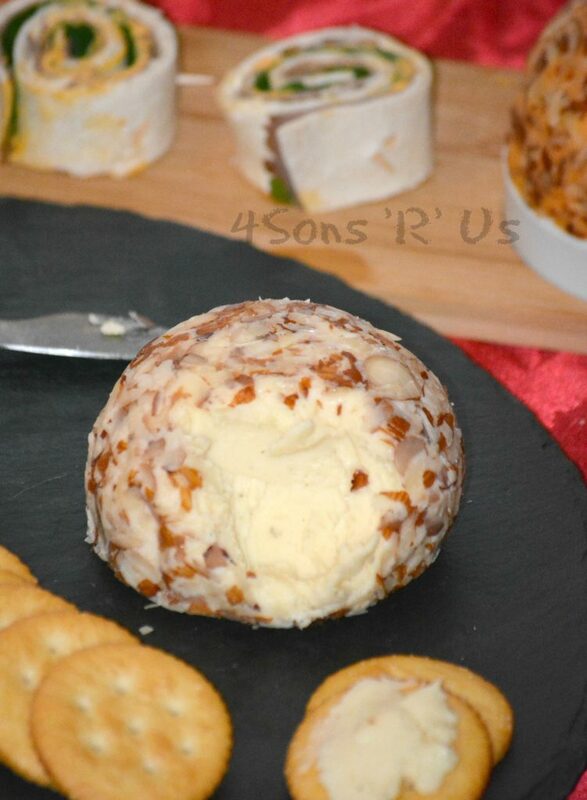 Rich & creamy spreadable cheese is always a gorgeous crowd-pleaser. Finding creative, irresistible snacks and appetizers to incorporate it into my holiday menu is what really makes my table ‘pop’ to guests. No one will ever guess that the flawless finger food they can’t stop returning to the table for was actually a cinch to whip up, even at the last minute. It also means that the second batch you’re inevitably going to have to make won’t take you away from your party for long. 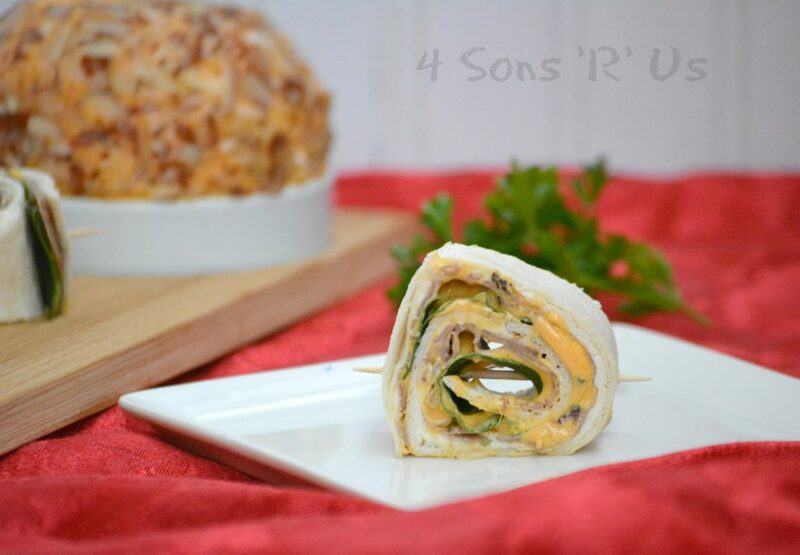 That’s where these lovely little Roast Beef & Cheddar Horseradish Pinwheels enter the party. They’re loaded with flavor, easy to whip up, and like I mentioned earlier– the perfect finger food. Soft flour tortillas are spread with a mixture of cream cheese, Dijon mustard, and spicy horse radish. They’re then topped with a layer of thinly sliced deli roast beef. 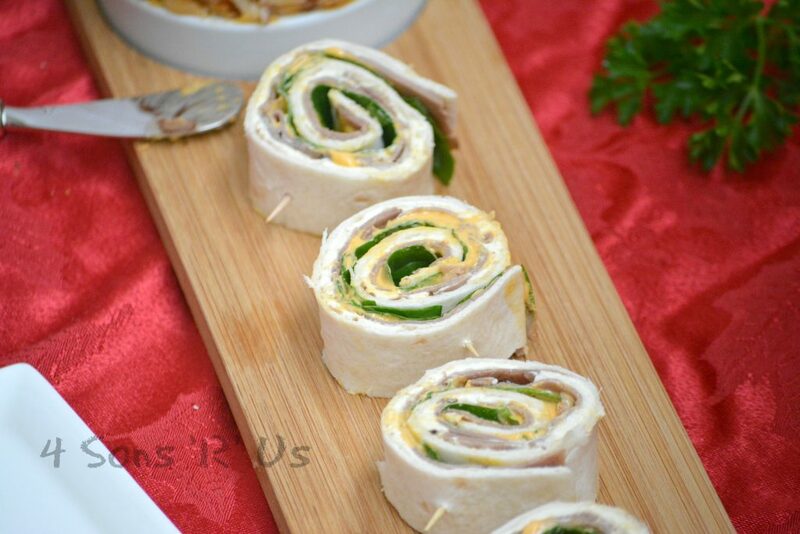 Spread liberally with a rich layer of Kaukauna® Cheese and some spinach leaves for ‘color’, they’re rolled up tightly, and sliced into perfect little pinwheels. 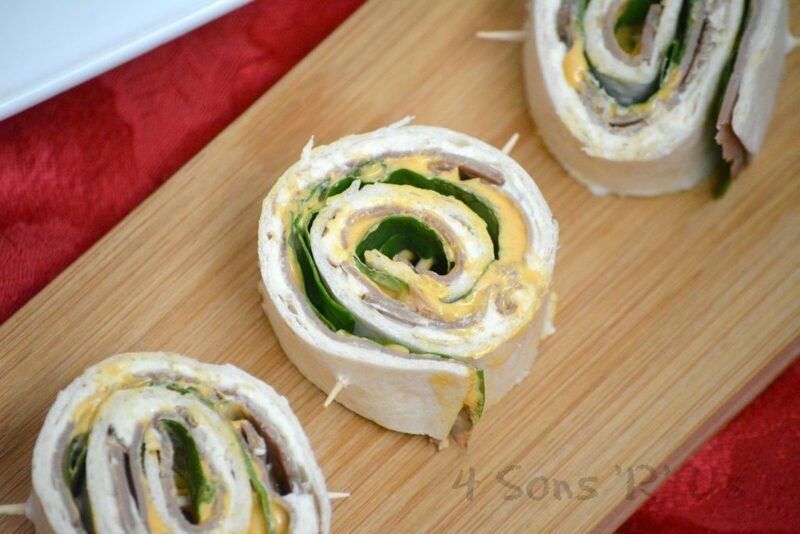 These Roast Beef & Cheddar Horseradish Pinwheels are easy to make. Easy to serve. Easy to have a flawless appetizer on hand when guests arrive– even for the ones who didn’t RSVP. You know it happens!! 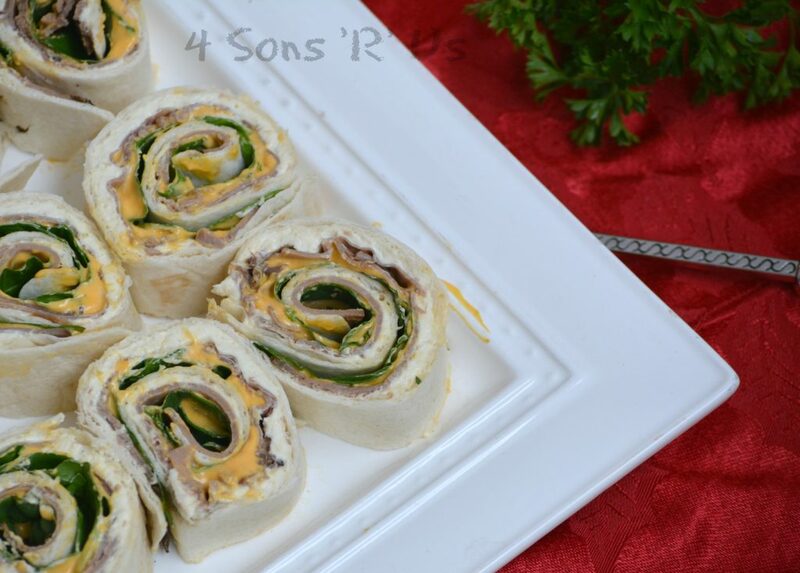 A quick & easy finger food, these yummy Roast Beef & Cheddar Pinwheels can be made ahead of time and refrigerated until ready to serve. In the bowl of a stand mixer, cream together the softened cream cheese, mustard, and horseradish until evenly incorporated and the mixture's smooth. Spread a quarter of the mixture evenly out over the under side of one of the flour tortillas. Repeat with the remaining tortillas, until the cream cheese is gone. Layer slices of roast beef evenly out over top the cream cheese mixture. Cover almost the entire tortilla leaving just a little bit of the edges clean. Divide the cheese ball into four quarters and spread a quarter out evenly over the roast beef on top of each tortilla. Spread a single layer of spinach leaves out over top to cover the roast beef. Starting at one end tightly (but without squishing) roll up the tortilla. Sit the tortilla with the end piece on the bottom. Using a sharp serrated knife, cut the stuffed tortillas into 1" slices. Use tooth picks to secure if needed. Serve immediately or refrigerate the pinwheels, covered, until ready to serve. For perfect, pretty slicing-- chill the filled and rolled tortillas for 5-10 minutes before hand. 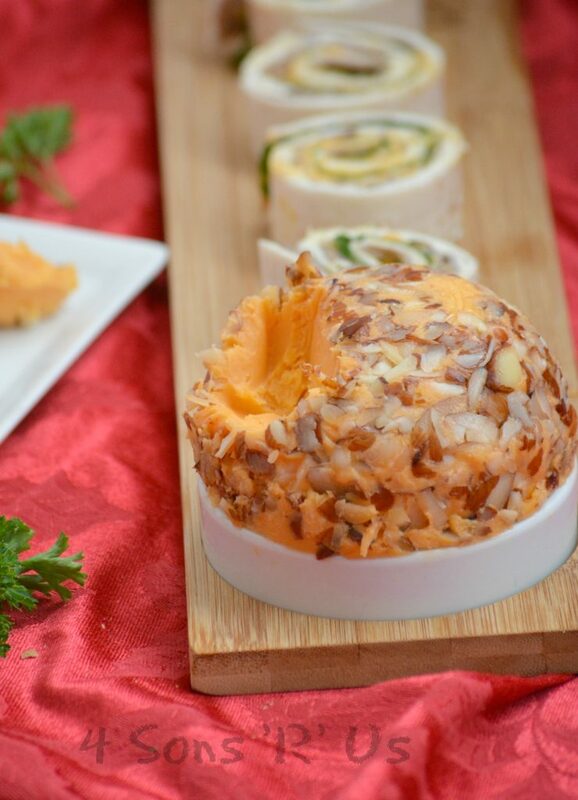 While we used the sharp cheddar in our pinwheel recipe, Kaukauna® Cheese Balls actually come in a wide variety of awesome flavor combinations. Sharp Cheddar, Port Wine, Smoky Bacon, Pepper Jack, Bacon Jalapeno, Asiago, Sriracha– just to name a few! Here’s the Parmesan Ranch flavored cheese ball we purchased to pair with some crisp, salty crackers. Is your mother watering yet? Are the wheels spinning with all the possibilities?? Do you want even more awesome entertaining ideas? Look here! And don’t forget to enter Kaukauna® Cheese’s awesome giveaway! Next time you’re out getting ready for the holidays, don’t forget to stop by your local Kroger and stock up on several yummy Kaukauna® Cheese Balls for your own festivities. 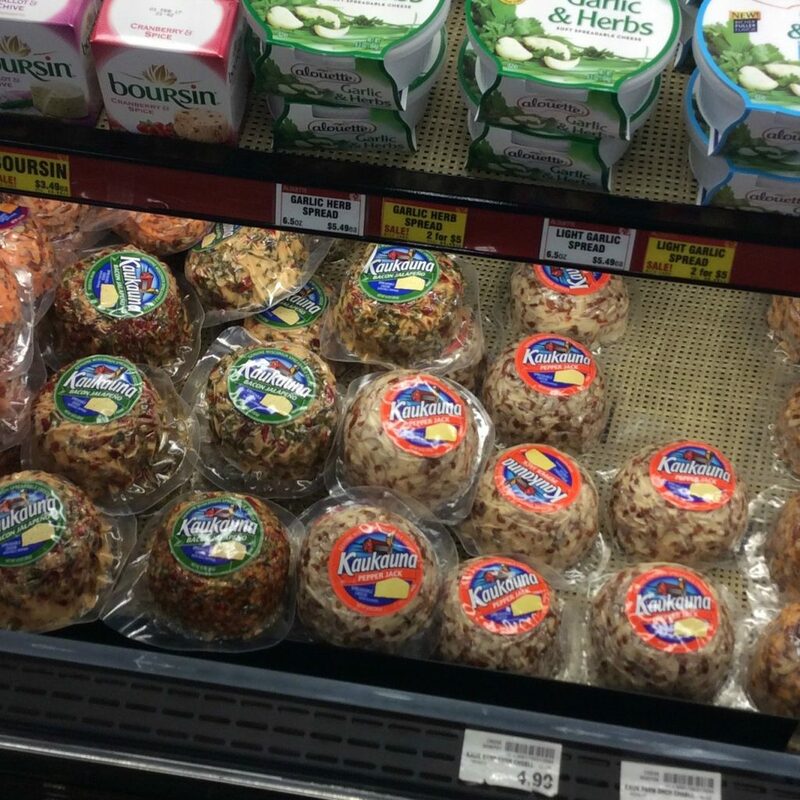 Just swing by the refrigerated specialty cheese section and grab whichever ones ‘speak’ to you.